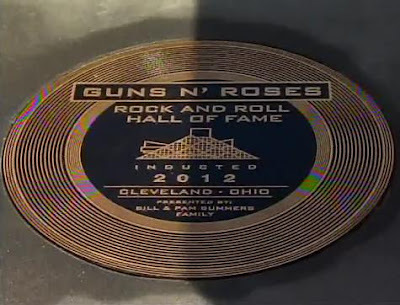 It’s just over a week away until the annual Rock & Roll Hall Of Fame inductions happen, and the Cleveland institution continues to chip away at its to-do list to ensure everything is ready to go. On Wednesday, bronze plaques honoring the newest class of Hall of Fame inductees were unveiled in front of Public Hall. Each of the 17 plaques reportedly cost around $5,000 to make; featured below is the one for Guns N’ Roses. Beyond the ceremony itself, the Hall hosts a series of events during the week as a build-up to the induction honors – check out the list of activities here.